The purpose of hog flooring is to provide good traction, a comfortable surface, and durability. Hog flooring should be designed, constructed, and maintained so as not to cause injury or suffering to pigs standing on it. Flooring also must be suitable for the size and weight of pigs and form a rigid, even, stable surface. The objective of pig flooring is to provide a durable, comfortable surface with good traction. Traction bars help reduce the chance of a sow slipping when getting up or lying down. Hog slats should also allow manure to filter readily through the plastic or cast iron grate, helping to maintain a clean, healthy environment for your pigs. Pig flooring that is easier to clean improves labor efficiency and reduces the transmission of diseases. Double L has a variety of hog flooring options for your pig needs - nursery, farrowing, cast iron, plastic, and flooring accessories. Double L has three nursery slat options for your pig needs. Our new nursery plastic grate floor, the Premier Nursery Floor, was designed for deep pit buildings. It's bright lime green color is for easy pig scour detection and cleaning. Each pig slat easily snaps together for fast and easy assembly. Its prime gap location is great for efficient beam support cleaning. Both the Premier and Advantage Floors are reversible for easy installation. The Advantage Nursery Floor has a 1/4" gap around the perimeter of each hog slat, making it easier to power wash clean and disinfect. The Excelerator Nursery Floor has 7/16" slot openings provide 50% open space manure filtration through plastic grate, leaving a clean floor that helps protect each pig from bacteria causing illness. Double L has a variety of farrowing floor options for your swine needs. 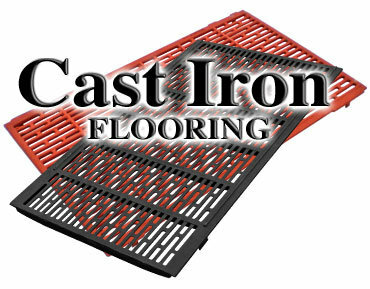 Plastic grate / cast combination floors, woven wire, tri-bar creep / ValuCast combination, and tri-bar / Schonlau cast combination. A farrowing floor should be cool for the sow and warm for the little pigs. The IVP57 and IVP68 Farrowing Floor Systems are comprised of cast iron and plastic creep slats that interlock, creating a nearly flat farrowing floor for your pigs. Cast iron under the sow is cool and Filter-Eeze polypropylene in the creep area is warm. The cast iron provides excellent traction for the sow, is durable yet comfortable, minimizes possible teat and foot damage, and helps reduce abrasions. The plastic grate in the creep area is non-conductive and does not rob body heat from little pigs. New Solid plastic grate creep panels available. The WV57 ValuCast and Ultra-Slat Creep Flooring is a self-supporting farrowing floor with corrosion-resistant hot-dipped galvanized steel creep and frame. It is constructed with 3-gauge woven wire. The TV57 ValuCast and Triangular Steel Creep Farrowing Floor is a self-supporting farrowing floor that is the cleanest creep floor on the market. Its triangular steel bars have 50% openings that allow manure to easily filter into the hog pit. The creep steel is mig welded, which is four times stronger than resistance welding and is built to withstand the constant movement and heavy weight of pigs. The PS57 Schonlau Cast and Plastic Creep Farrowing Floor is comprised of 5" PermaBeam, plastic creep, and Schonlau cast iron; one of the best cast iron floors on the market. The cast iron is cool for the sow and uncomfortable for the little pigs so they are inclined to stay off of it and less likely to get crushed. Pig Producers reported they save at least one pig per litter from a crush death, making the combination flooring system very cost effective. Double L has both Schonlau Cast Iron and ValuCast Iron Flooring available - both provide great traction and are very durable. Manufactured to ISO9002 High Quality Standards, Schonlau Cast Iron has rounded shaped bars that have NO sharp edges and is safer for sows. Non-porous, crowned surface is easy to clean with no flashing. ValuCast Cast Iron has 7/16" openings and is non-porous. It is available in a few different styles and sizes. 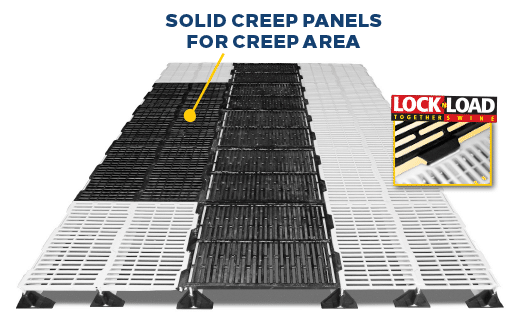 Double L has a variety of hog nursery and sow slats to fit your plastic grate flooring needs. Each slat is constructed of rugged virgin polypropylene that is non-conductive, reducing chilling and stress on your pigs. Filter-Eeze Maxima Nursery Flooring is made of superior quality polypropylene material which provides a warmth factor that does not rob body heat from the little pig. This allows the little pig to turn the feed they eat into pounds and not into fuel to heat their bodies. The Swine Maxima Creep Slats is also non-conductive, reducing stress and chilling of pigs. Interlocking feature for easy installation and textured surface for traction. L3742 Hog Creep Slat and L3760 Hog Nursery Slat are joined with locking pins and have radiused corners for strength. Slats easily interlock for easier, less costly installation. Double L has three Nursery / Grower Floors available in 24" x 24" size with different tiered pig weight options. 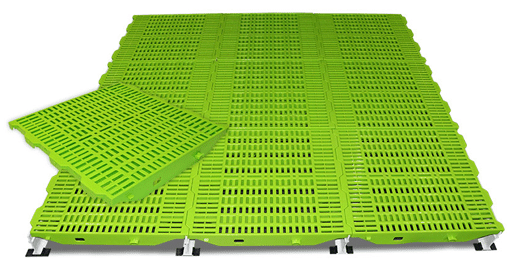 The new Premier Nursery Floor has a bright lime green color for easy scour detection of pigs up to 120 pounds. The Advantage Nursery Floor is for pigs up to 150 pounds and has 1/4" gap perimeter that is easy to power wash clean. Excelerator Nursery Floor is a high impact virgin polypropylene slat for pigs up to 75 pounds. Double L has a variety of flooring accessories to complement your hog floor needs. The 5" PermaBeam is the strongest fiberglass support beam on the market. The Plastic Clip and Plastic Triangle protect and stabilize fiberglass beam under hog flooring. 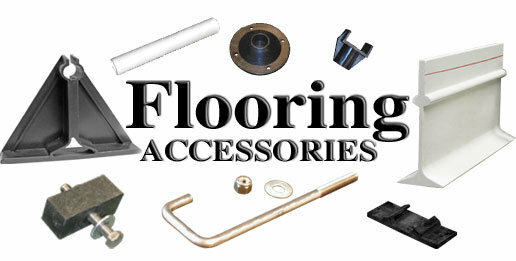 Additional flooring accessories available include: Poly Slat Loc, Leg Kit, Fiberglass Tubing, Flooring Locking Pin, J-bolt, washer, and Locknut.